Do viruses attack your PC again and again in spite of installing of different anti-virus software's in your PCs you face the problem and with the passage of time, your PC speed goes down. You do not understand which anti virus should be used to remove these high-risk viruses and malware from your PC. Guys! today I am telling you about a highly powerful virus removal tool. It is ComboFix. ComboFix is a program, created by sUBs, that scans your computer for known malware, and when found, attempts to clean these infections automatically. 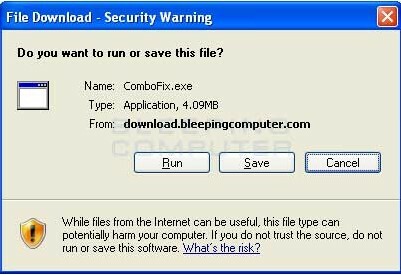 In addition to being able to remove a large amount of the most common and current malware, ComboFix also displays a report that can be used by trained helpers to remove malware that is not automatically removed by the program. What to do with Combofix? 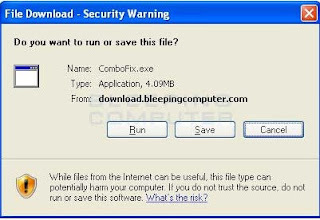 To download ComboFix, click the link given at the end of the page, When you click on the link you will see a download prompt similar to the one below. When you have the Save as screen configured to save ComboFix.exe to the Desktop, click on the Save button. ComboFix will now start downloading to your computer. If you are on a dialup, this may take a few minutes. When ComboFix has finished downloading you will now see an icon on your desktop similar to the one below. You are almost ready to start ComboFix, but before doing anything, you need to take some preventative measures so that there are no conflicts with other programs when running ComboFix. At this point, you should close all open Windows. In presence of any anti-virus installed at your PC, combo fix does not work properly and may be possible to ask you to uninstall the anti-virus before running combo fix. if you run combo fix without uninstalling the anti-virus, it will not work. double-click on the ComboFix icon found on your desktop. Please note, that once you start ComboFix you should not click anywhere on the ComboFix window as it can cause the program to stall. In fact, when ComboFix is running, do not touch your computer at all. The scan could take a while, so please be patient. Once you double-click on the icon, you may see a screen similar to the one below. 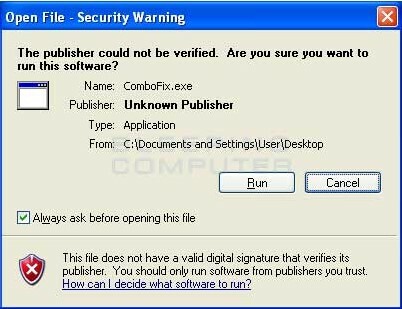 Windows is issuing this prompt because ComboFix does not have a digital signature. This is perfectly normal and safe and you can click on the Run button to continue. If you are using Windows Vista or Windows 7, and receive UAC prompt asking if you would like to continue running the program, you should press the Yes button. 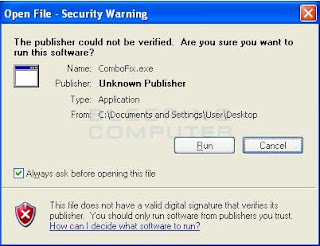 You will now see the ComboFix disclaimer screen as shown below. Please read through the disclaimer and if you do not agree to it, then please click on the Cancel button to exit the program. Otherwise, to continue you should click on theI agree button. If you clicked on I Agree, ComboFix will now install itself onto your computer. When it is done, a blue screen will appear as shown below. ComboFix is now preparing to run. 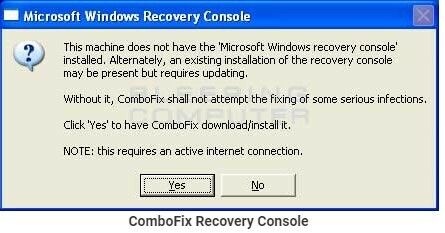 When it has finished ComboFix will automatically attempt to create a System Restore point so that if any problems occur while using the program you can restore back to your previous configuration. When ComboFix has finished creating the restore point, it will then backup your Windows Registry as shown in the image below. You should now press the Yes button to continue. 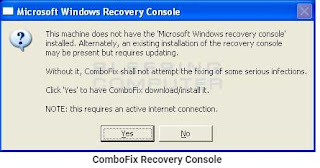 If at any time during the Recovery Console installation you receive a message stating that it failed to install, please allow ComboFix to continue with the scan of your computer. When it is done, and a log has been created, you can then perform the manual install of the Recovery Console using the steps found in the manually installing the windows recovery console section. While the program is scanning your computer, it will change your clock format, so do not be concerned when you see this happen. When ComboFix is finished it will restore your clock settings to their previous settings. 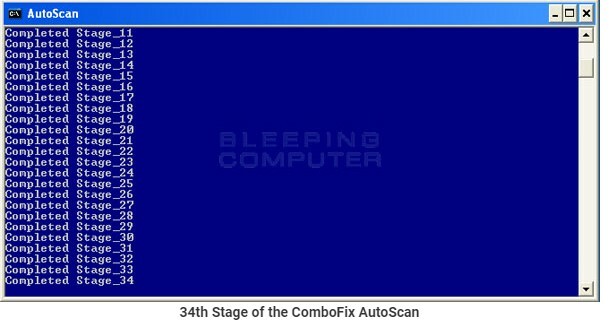 You will also see the text in the ComboFix window being updated as it goes through the various stages of its scan. At the time of this writing there is a total of 50 stages as shown in the image below, so please be patient. The amount of stages will go up as time goes on, so if the amount of stages different when you run it, please do not be concerned. 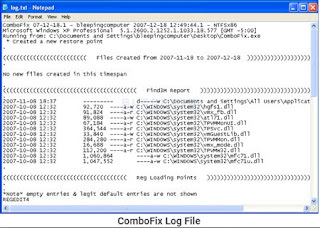 When ComboFix has finished running, you will see a screen stating that it is preparing the log report as shown below. This can take a while, so please be patient. If you see your Windows desktop disappear, do not worry. This is normal and ComboFix will restore your desktop before it is finished. 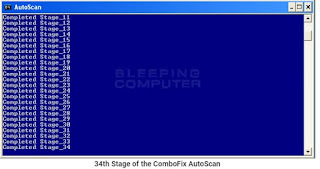 Eventually, you will see a new screen that states the program is almost finished and telling you the programs log file, or report, will be located at C:\ComboFix.txt. This can be seen in the image below. 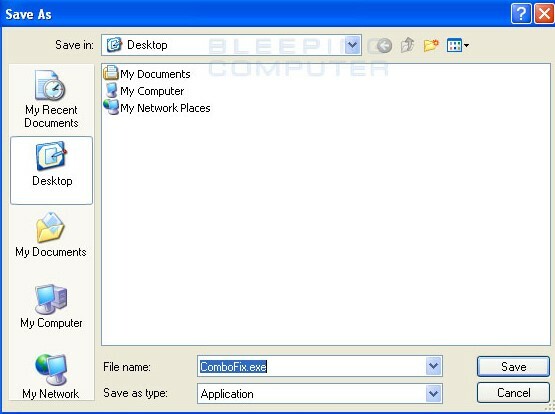 When ComboFix has finished, it will automatically close the program and change your clock back to its original format. It will then display the log file automatically for you as shown below.